To the Celts, the Elder (also known as the "Tree of Faeries," "Old Gal," "Pipe Tree" and "Lady Ellhorn," among others) was the symbol of both death and rebirth. Its twigs were said to enable the wearer to see spirits and experience visions. Justice was dispensed by the Druids beneath this tree. Much like the Winter Solstice itself, it highlighted a time of evolution. The Druids believed that it was during this period that their Sun or Solar Spirit was being held prisoner. It was also considered a time of trouble and indicative of the struggle for supremacy. By virtue of being considered sacred to the faeries, Elder branches were once hung above stables in order to protect horses from evil spirits. Paradoxically, in some parts of Europe, this tree was once generally regarded as an ally of witches. For many generations, it was thought to be unlucky to burn Elder and an omen of death to bring it indoors. In addition, it was also believed that anyone who cut the wood of this tree risked being turned into stone. In one Christian legend, it was from the branches of an Elder that Judas hanged himself after the betrayal of Christ...at which point the Elder forever lost its ability to grow straight and strong. In another, it is said that the cross upon which Christ was crucified was made of Elder...and the reason why the tree has stood in stooped remorse ever since. Some Irish legends claim that Saint Patrick used a branch of Elder in the form of a sacred rod in order to drive out all the serpents from Ireland. Often planted close to the home, the Elder was thought to offer protection against evil influences and lightning...based on the fact that the tree itself never seemed to get struck and it was hoped such immunity would extend to the nearly dwellings. In ancient times, it was believed that negative forces would be attracted by someone who fell asleep beneath an Elder tree. While slumbering, it was thought such a person would suffer horrific nightmares and become delirious upon waking. The Elder, a a common member of the Honeysuckle family, frequently displays a sprawling habit and can grow to 30 feet in damp clearings or along the edge of woods. In general, many liberally-branching stems emerge from the ground. In essence, it is considered too small and feeble to be a true tree, while being too large and airy to be categorized as a bush...essentially falling somewhere inbetween the two. The light-gray bark of the Elder is rough and covered with wart-like breathing pores. The branches are flexible and can be broken without much trouble. The inner pith of the twigs is akin to cork and may be easily transformed into instant popguns and pipes...thus endearing this tree to countless generations of children. The wood of the Elder has never been put to many uses, being too weak for building material, but it was once believed that flutes made from Elder held the power to enchant spirits. The leaves are feathery and emit a foul smell which is apparently useful for warding off flies. Often planted as a hedgerow tree, cows appear to be particularly appreciative of the shade offered by the Elder, especially on days when swarms of insects can be irritatingly bothersome. The tiny white flowers of the Elder bloom in bunches and exude a sweet and heavy scent, which is slightly narcotic and distinctly heady. The Elder's flowers, though difficult to dry, are the most medicinally useful part of the plant, having been used as a cure for eilepsy, warts, toothache and cleansing of the blood. By the end of Summer, the Elder's blossoms have developed into drooping bunches of small purplish-black berries, which are a welcome source of food for the birds in the area. 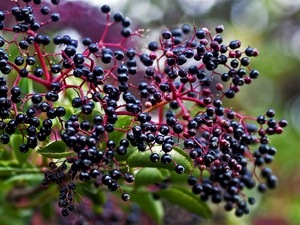 Elderberries are a rich source of vitamins and in Britain and much of Europe, still count among the most popular of the wild-foods. A plant which loves nitrogen, the Elder thrives on organic wastes, and since its damaged branches regrow, it has long been a symbol of the circle of life and rebirth...a new beginning from the old. Pregnant women would often kiss the Elder to ensure good fortune and health for their unborn child. There are two distinct types of Elder individuals (a division which relates to all Celtic Tree Signs). The "new moon" character is associated with the first two weeks of a sign and the "full moon" character is associated with the last two weeks. The "new moon" Elder individual is usually more outspoken and impulsive than his or her "full moon" counterpart. Such people are extremely persuasive orators who constantly challenge injustices or what they perceive to be corrupt powers. The "full moon" Elder individual possesses great vision and inclined to operate more successfully in the background rather than pursuing a confrontational approach. The Elder individual evolves gradually during his or her lifetime. In youth, such people are inclined to waste much time and energy on worthless ventures or projects. They are often fortunate individuals who frequently benefit at an early age from inheritances. However, this usually only encourages their extravagant tastes and indulgences. With a basic restlessness and/or insatiable curiosity, Elder individuals are drawn into the study of profound subjects and are prone to travel great distances in order to further their knowledge. Elder individuals are self-sufficient, lively and outspoken. They dislike routine and refuse to be pressured by others. Highly energetic with a great deal of stamina, they thrive on change and crave constant mental and physical challenge. In later life, the Elder individual commands respect and possesses a great deal of patience. However, Elders can sometimes be heartless and cruel, and have a tendency to lack good judgment in their choice of friends. Ambitious, with a driving force to win at all costs, Elder characters are often outspoken and prone to speak without first thinking, but they possess a constructive approach to life and are frequently drawn to careers in the military or journalism. The true strength of Elders lie in the instinctive knowledge of when they are right and others are wrong, coupled with their inherent inclination toward self-discipline. The Elder individual is open in his or her relationships, but tends not to fall in love very deeply, seemingly able to remove their emotions from most situations. While finding it difficult to tame their restless natures enough to take on parenthood, Elders do make wonderful uncles and aunts. It is important that Elder indiviudals learn to use change as a positive force in their lives in order to avoid becoming reckless and confused.